There are many models for doing your best in potentially challenging situations. One approach is learn from athletes who aim to perform at their best in sports. An athlete may spend ten years working towards their big day in the Olympic Games. How can they approach such an event? One approach is to hype themselves up because they really want to win the prize. This can work, but it can also lead to tightening up. Another approach is to do everything possible to prepare for the event. It is then to follow the principles they believe in to perform at their best both physically and psychologically. This sometimes calls for seeing the event in perspective. They can define themselves by whether or not they do their best, rather than by if they win the prize. Yes, the event is important, but their life will go on afterwards. How can they enter this psychological zone? Sometimes we are at our bravest and do our best work when we have nothing to lose. Bearing this in mind, athletes sometimes pursue the following path. 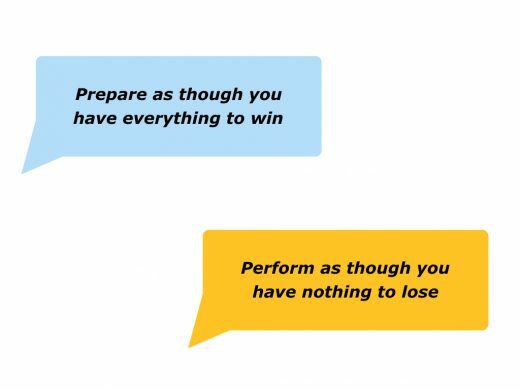 Prepare as though you have everything to win; perform as though you have nothing to lose. Have you ever used this approach in your own life? You may have been going for an interview, pitching for a piece of business or doing something that required you to be brave. You prepared properly, were fully present and then performed superbly. Whilst not being foolhardy, you chose to flow, focus and do fine work. You may or may not have won the prize, but you did feel that you had done your best. 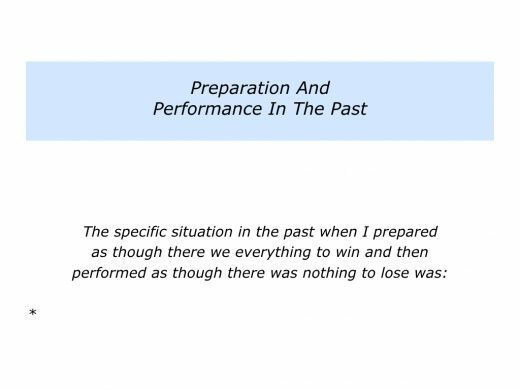 Describe a specific situation in the past when you prepared as though you had everything to win but and then performed as though you had nothing to lose. 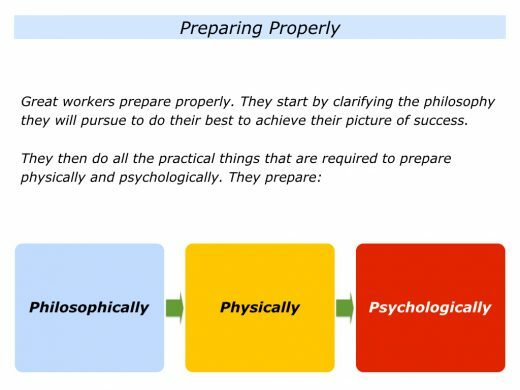 Great workers prepare properly to increase the chances of success. They have a positive frame of mind and focus on the potential opportunities. They also try to create as much predictability as possible. Such people also plan how to deal with challenges and uncertainties. They clarify how to manage such potential issues. They then rehearse following their chosen strategies to do their best to achieve their picture of success. Imagine that you are going to tackle a challenge. You can, if you wish, prepare in the following ways. Great workers often follow their chosen philosophy to do fine work. Here are some of the questions you may want to ask when preparing to tackle a challenge. Looking ahead, what is the challenge I want to tackle? What are the things I can control in the situation? What are the real results I want to achieve? 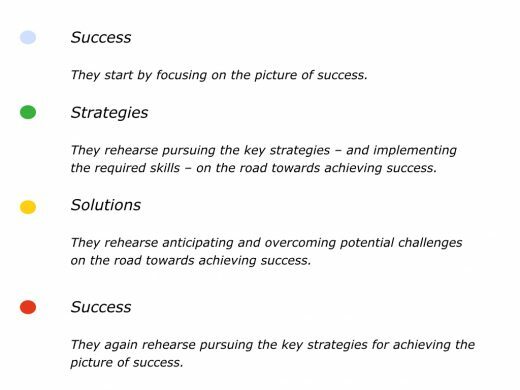 What is the picture of success? What is the philosophy I want to follow when tackling the challenge? What are the principles I want to follow? How can I follow these principles when tackling the challenge? How can I translate these into specific strategies? What are my strengths? How can I build on these when tackling the challenge? How can I compensate for any weaknesses? What are the key strategies I can follow to give myself the greatest chance of success? What are the potential problems I may face when tackling the challenge? How can I prevent some of these problems happening? How can I manage the problems if, despite everything, they do happen? How can I then stay calm and find creative solutions to the problems? Bearing in mind the strategies I want to follow, how can I get some quick successes? How can I maintain the momentum? How can I keep doing the right things in the right way? How can I encourage myself and others on the journey? What else can I do to do my best to achieve the picture of success? Great workers make sure they get the physical things right when preparing to tackle a challenge. This includes making sure all the practical things work properly. Here are some of the questions you can ask to set things up for success. What are the practical things that need to be done? How can I make sure these things are done properly? What else can be done to ensure everything works properly and provides the platform for success? How can I prepare myself physically? How can I get enough sleep? How can I eat the right food? How can I manage my energy? How can I make the best use of my prime times – the times of the day when I have most energy? How can I build in times for rest and recovery? How can I follow a daily rhythm that enables me to do my best work? How can I organise my time in blocks so I can give full attention to each of the tasks? How can I manage the transitions between the various tasks? How can I get the right balance between clear thinking time, creative time and cruise control time? Great workers prepare psychologically before tackling a challenge. Here are some of the questions you can ask around this theme. Let’s start by looking at my motivation. On a scale 0-10, to what extent am I motivated to tackle the challenge? How can I maintain or improve the rating? What will be the benefits of tackling the challenge successfully? Looking back, when have I tackled a similar challenge successfully? What did I do right then? What were the principles I followed? How can I follow similar principles – plus maybe add other skills – to tackle the challenge successfully? How can I relax, re-centre and refocus – especially when I need to buy time to make a decision? How can I rehearse the next thing I want to do? How can I then do my best to deliver the desired results? How can I keep following the positive principles I believe in? How can I keep asking: a) What am I doing well and how can I do more of these things in the future? b) What can I do better and how? How can I create and follow a positive mantra? 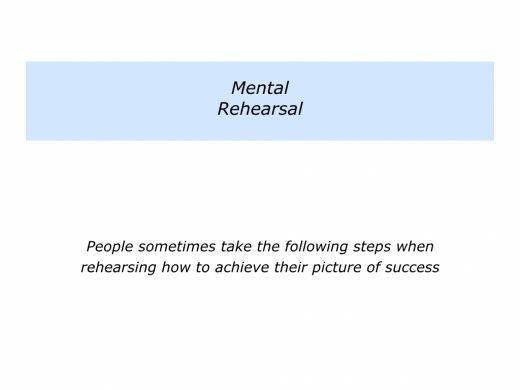 Great workers do lots of mental rehearsal before tackling a challenge. You will have your own approach to making this happen. Here is one approach that people adopt to take these steps. Imagine that you are going to tackle a challenge in the future. 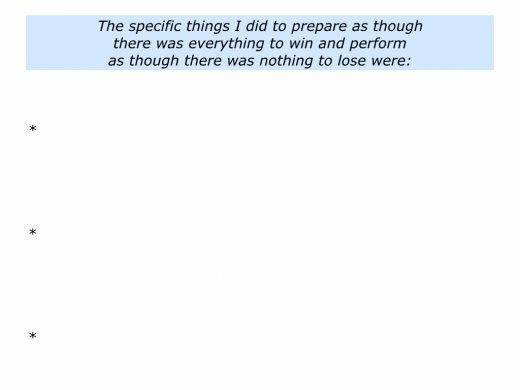 You will do everything possible to prepare and set things up to succeed. It will then be time to go onto the next stage. Great workers always do the basics. They then, when appropriate, add the brilliance. This approach obviously depends on pursuing the right strategy and having the skills to implement it properly. Sometimes this also depends on having a certain state of mind. Some soccer players, for example, will fight hard when the score is 0-0. If they take the lead by going 1-0 up with 15 minutes to go, however, something happens to their mentality. Great players continue to be positive and professional. They keep doing the right things in the right way. They keep controlling the game, winning the ball and retaining their shape as a team. Poorer players start watching the clock, however, and become paralysed. Feeling they have something to lose, they retreat towards their own goal. This frequently results in them drawing or losing the game. A similar rule applies in other areas of life. This is summed up in the saying that goes along the following lines. Be very afraid of the person who has nothing to lose. Keep doing the things that got you into this winning position. Do not stop doing these things and expect to win. Such workers maintain a positive attitude and keep doing their best. They aim to leave everything on the field, the stage or wherever they are performing rather than have any regrets. 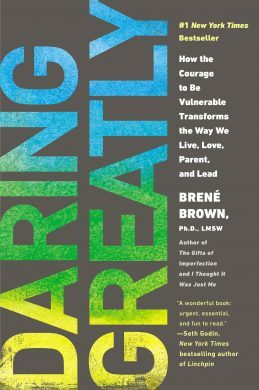 Brené Brown describes how people dare to embrace challenges in her book Daring Greatly. She says that courage calls for daring to be creative and doing your best. You can discover more about her work via the following link. Brené quotes Theodore Roosevelt’s speech called The Man In The Arena, which he gave at The Sorbonne in 1910. Here is the extract which has become famous. Let’s return to your own life and work. 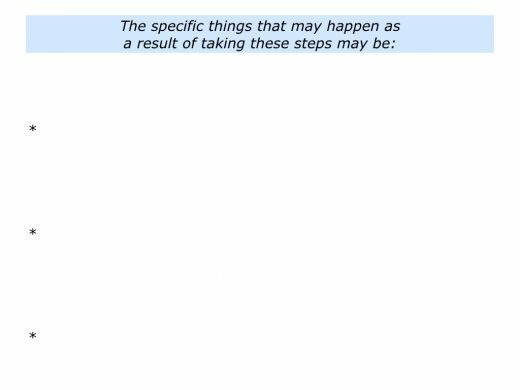 Looking to the future, can you think of a situation in which you want to take some of these steps? 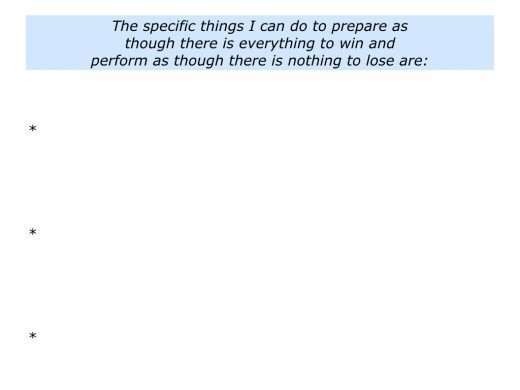 You will prepare as though you have everything to win. Going into the situation, you will keep following your chosen principles. When appropriate, however, you will perform as though you have nothing to lose. 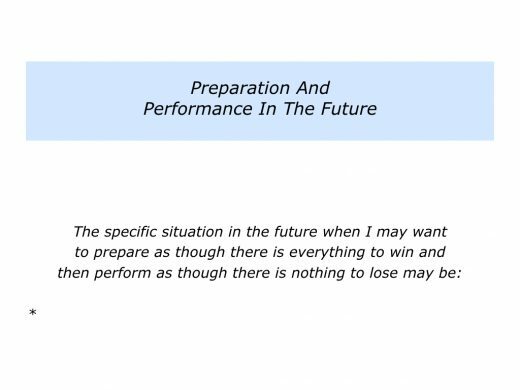 Describe a specific situation in the future when you may prepare as though you have everything to win but and then perform as though you have nothing to lose. 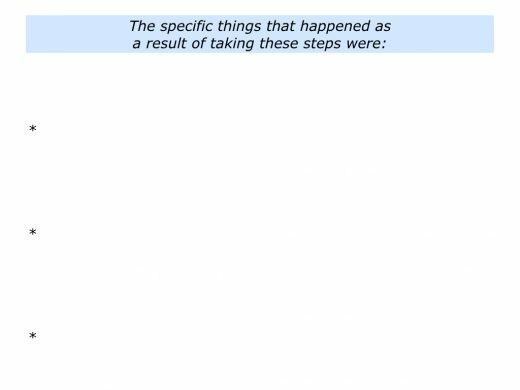 Describe the specific things that you can do to take these steps.